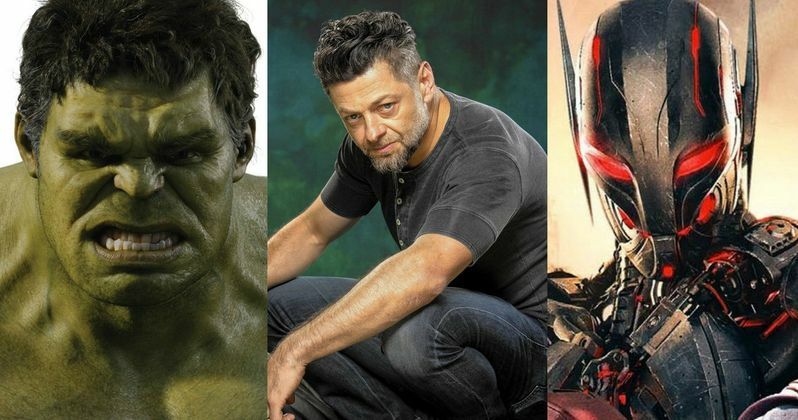 When Avengers: Age of Ultron hits theaters next year, fans will get to see two different aspects of Andy Serkis' work. The actor/motion capture artist has an on-screen role in the Marvel Phase Two sequel, and while he was briefly spotted in the official trailer released last month, it still isn't clear who he is playing. He also worked on the motion capture aspects of the sequel, through his company The Imaginarium. The actor recently shed new light on his Mo-Cap work for the sequel in an interview with Empire. Take a look at what he had to say about developing the look of Ultron, before James Spader signed on. "We did some work on Ultron. On the development of Ultron before James Spader came on board. In terms of movement styles: was he gonna be human-like? Was he going to be robot-like? So we worked with a bunch of different people, from body-popping experts to dancers, to this guy called Neil who's nearly eight feet tall." Andy Serkis also worked with Mark Ruffalo, who returns as the Hulk in this sequel. Here's what Andy Serkis had to say about how he helped Mark Ruffalo get into character as the Hulk, creating a new improved take on the iconic Marvel behemoth. "We gave Mark weights, we had voice projections so he could do his Hulk roar. On screen we could have a virtual representation of the low-res avatar of The Hulk, so he could come out and feel that sense of scale." As far as who Andy Serkis is playing on screen, there is speculation that he may be portraying Marvel character Ulysses Klaw. That, naturally, has not been confirmed at this time. We'll likely have to wait until director Joss Whedon's superhero sequel hits theaters next May to find out for sure. Stay tuned for more details in the very new future.